(125 sq. meters). Located downstairs with ten foot ceilings. Bedrooms are air conditioned with ceiling fans. Living room, dining room and kitchen have ceiling fans and excellent cross ventilation from eight foot tall sliding glass doors. Flooring is Berber carpeting with oak hardwood in entry and kitchen. Queen bed in master bedroom with pillow top mattress and Egyptian cotton linens. Master bath has double sinks and a large Jacuzzi tub for two with shower. Second bedroom has twin beds. Second bath has double sinks and deep soak tub with shower. Granite counters in kitchen and baths. Full kitchen with ceramic top stove and double door stainless refrigerator with ice maker and water in the door. Full set of pots and pans, dishes, glasses and stemware. Indoor dining table seats six plus four bar stools at the kitchen counter. Fifty inch HDTV in living room and HDTVs in both bedrooms. 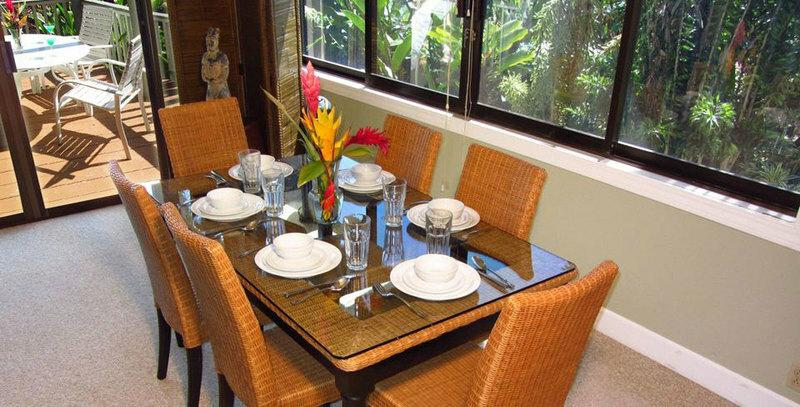 Covered lanai with outdoor dining table for six and gas barbecue. Beach chairs, beach towels and cooler provided. We also offer off street parking, high speed wi-fi property wide, the use of a computer and printer 24/7 in our office, an on site concierge service that saves money on activities, beach chairs, beach towels and coolers, plus the use of laundry rooms with detergent and dryer sheets. All are complimentary. Beds: 1 queen, 2 twin. Rooms: Sleeps 6, 6 dining seats. Kitchen: Full Kitchen, Refrigerator, Coffee Maker, Ice Maker, Microwave, Toaster, Cookware, granite counters, Four Bar Stools, Toaster Oven, Blender, Ceramic top stove with oven. Living: Ceiling Fans, Linens, Ironing Board, Jacuzzi Tub, High Speed Internet, Berber carpeting. Business: Nearby ATM, Nearby Post Office, Nearby Internet Cafe, Nearby Bank. Outdoor: Deck, BBQ Grill, Gas Grill, Outdoor Shower, Beach. Geographic: Near Beach, Close to Town.